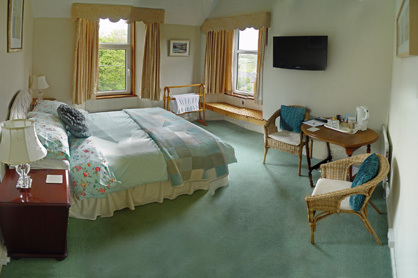 Our comfortable en suite bedrooms are fitted with down duvets and are provided with a welcome coffee / tea and biscuit courtesy tray that will help you feel at home. Enjoy the tranquil garden setting that you are welcome to relax in, surrounded with the sounds of the country life and the garden birds we enjoy feeding each day. Lose yourself in a book or watch TV in your room or in the private guest lounge / dining room and enjoy a log fire on cold evenings. Ask your hosts if you need assistance to make reservations for dinner from a selection of excellent local restaurants. Unpack your walking boots and binoculars and take a leisurely stroll or a hike to the Wildfowl and Wetlands Trust as well as the Caerlaverock Nature Reserve along the Solway coast line; a mile from our front door. If you bring your bicycle, the National Route 7 bypasses our home, commonly chosen by cyclists riding from John 0’Groats to Land’s End. Badgers, foxes, hedgehogs, hare, pheasant, and many species of garden birds, wildfowl and waders can be found in and around our home. Dumfries is 5 miles drive from Hutton Lodge, 2 hours drive from Glasgow and Edinburgh to the north and approximately a 1 hour drive from the Cumbrian Lake District to the south. Dumfries and the surrounding region, within a radius of approximately 20 miles, has at least eight 18-hole golf courses. 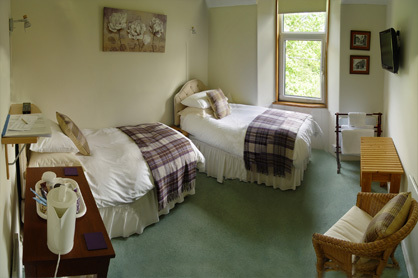 Our fees are from £35 per person per night sharing. To check availability please use the booking form or alternatively you can call or email us to reserve the room. Once confirmed, use the Pay Now button below (linked to PayPal) to secure your booking. Room reservation cannot be guaranteed unless a deposit payment has been received.